You arachnophiles and creepy-crawler-lovers are about to have your hearts melt. Even I, an avowed arachnophobe, find it almost endearing (almost). 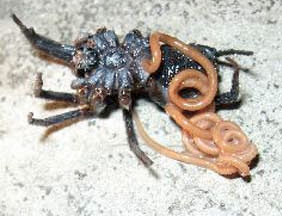 Behold a mother giant whip scorpion tending to her brood. Isn't that too much? Look how pearly green they are. 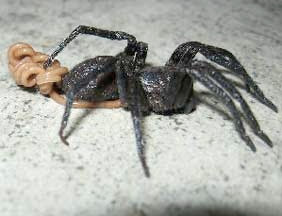 Awe, that's so...no...no...must not let my arachnophobia fail me now. I must leave and reevaluate my feelings. Thanks for the photo, Mary. This bird is thinking the same thing I am. It involves a question word, a definite article, a muffled expletive, and a question mark. But I have the good fortune of sitting in the digital glare of my computer screen, not floating above the scaly leviathan. Are there any ichthyologists out there that can ID this for us? The answer to that question is yes, so let me rephrase. Are there any readers out there that can ID it? 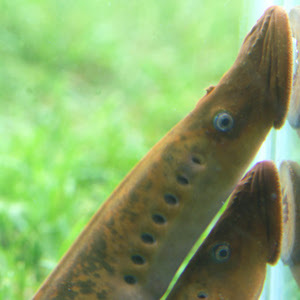 You're looking at the puckered face(s) of the lamprey, or lamprey eel. 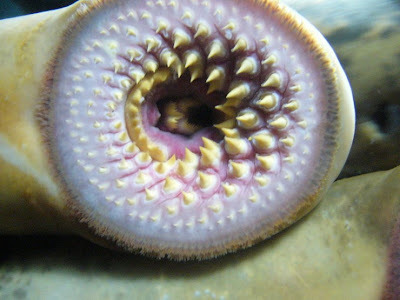 These jawless parasites aren't actually truly representative of lampreys in general--most lampreys aren't parasitic. In fact, these nasties (I've gone fishing for them before, so I know!) aren't truly representative of fish in general, due to differences in morphology and physiology. These differences include: no scales, no paired fins, and a single nostril on the top of the head. And since they are cartilaginous (no bone skeleton), they strictly aren't even vertebrates. These fish (or whatever they are) have no true taxonomic home. That's why, I believe, they have turned to latching themselves onto whatever host they can find, if for no other reason than to find a place to belong. Much like an obnoxious younger sibling. 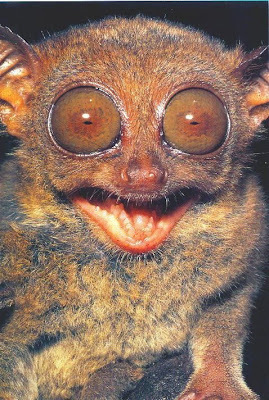 I've had a hard time finding an ugly photo of the tarsier. Most of them are cute, what with their petiteness and binocular vision. So I had to go with freaky. Anyone care to guess whey they're called tarsiers? It's because of their elongated tarsus bones (the bones in your foot that join to your toe bones). I'm not sure why their hand bones became the basis for their name. I would think those eyes would take precedence. I'm just glad that I've been named 'wise man' by those who dish out Latin names. This little beauty comes to us from ICanHasCheezburger.com via Kritter. It's a big pair of snails. I don't think any less of the man wearing gloves while handling these monsters. But it looks as though he has become a bit distracted; he didn't notice that the fore-most snail has pick pocketed a quarter and is about to stuff it up its shell. How many times must I say that mollusks cannot be trusted? A little FYI: this globe seems to favor invertebrates. While we have only been given about 264 species of monkey, there are an estimated 35,000 species of land snailes alone. That's a lot o' gastropod. 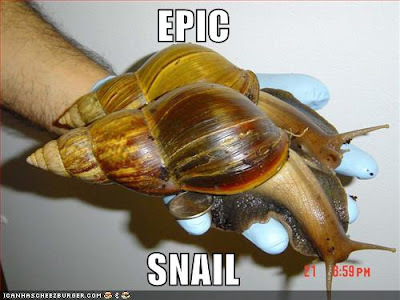 Thanks for th giant snail photo, Kritter. Would Shelob have been more or less scary colored like this leaf spider? I'm guessing less, but the image of Sam driving Sting into that neon-yellow abdomen is intriguing. The next time you come across a bonafide spider expert (some of them are readers and commenters on this blog), be sure to give them a pat on the back. There are more than 37,000 species of identified spiders, with estimates that the number is twice that. There far fewer species of mammals (less than 5,000 catalogued) than spiders. That makes for a lot of Latin names to know, spinnerettes to identify, and venoms and urticating hairs to endure (not to mention webs and heebie-jeebies). 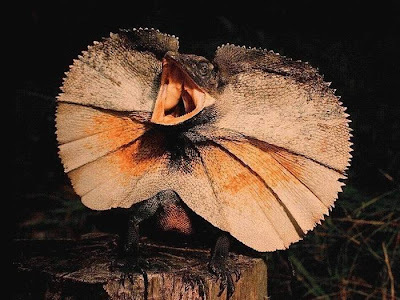 You're looking at the frilled lizard, complete with fully deployed frill. These Australian reptiles are arboreal, but when out on the savannah, this is their defense mechanism. If a meanie gets too close, they rear up on their hind legs, unfurl their scaly nimbus, then open their mouth and hiss (my brother does something similar whenever my mom asks him to do the dishes). If the threat doesn't work, and the meanie continues showing an interest in wanting to eat the frilled lizard, the reptile turns tail, knowing the jig is up, and runs for the nearest tree, hissing and frilly the whole way (again, much like my brother, when my mom persists). 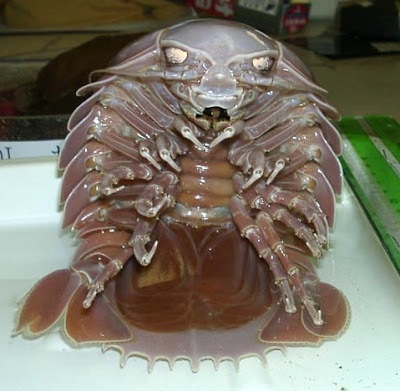 The giant isopod has given me a new-found respect for rolly pollies. I've always gone out of my way to scoop up stray ones and deposit them somewhere warm and dank and decomposey. But now that I live in fear of their bigger, deep-sea-dwelling cousins, I'm extra considerate. For you seafood enthusiasts, these critters can get to be 3 lbs, and they are often served in the Orient (like every other oddity seems to be). They have delicious white meat,very much like crab. For you horror film enthusiasts, here's your next monster. Thanks for the photo, Danielle. Ugly Overload turns two years old today. That means that UgO can finally ambulate on two feet, can speak in quasi-comprehensible complete sentences, and is almost due to be potty trained. But until that time, I look forward to another year of ugly. I hope you do too. I'm not the activist type, but I consider it my personal duty to bring you animals that are otherwise ignored or shunned. 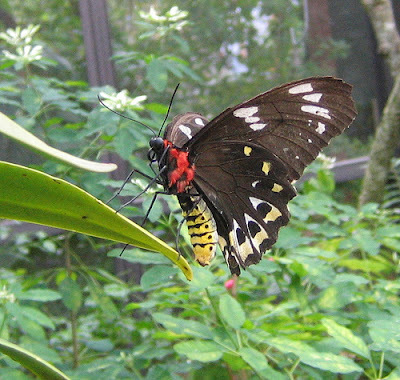 Laura sent me this shot she took in Florida's Butterfly World. She prides herself in this photo, not so much because of the colorful wings and snazzy thorax, but because of that alien face. This just goes to show that sometimes even pretty things shouldn't be looked at too closely. 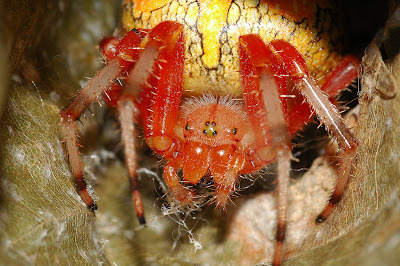 Jade, one of our resident arachnophiles, forwarded this lovely set of photos. You're looking at what happens when a Mermithid (almost a pretty word) worm (not a pretty word) reaches maturity. This worm, like others I've posted on, often directs its host to seek water in its final moments of life. Thanks, Jade. Spiders and Alien-style parasites in one post. I'll never be the same. Today is Friday. It is my last day of work before a four day weekend. That makes me happy. How synchronistic was it then, that Danielle sent me a photo of one of the happiest creepy crawlies around. 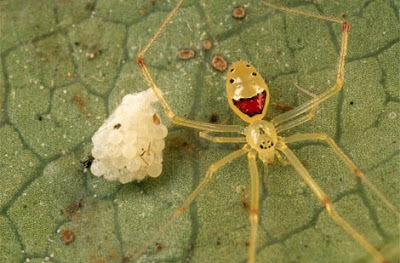 Say hello to the happy face spider (Theridion grallator). They are native--surprise, surprise--to several of the Hawaiian islands. They call it the nananana makakiʻi. So, if you find yourself suffering from the holiday blues, just think of this happy mother. If she can find happiness, so can you. Snapping turtles never look happy, but this one looks grumpier than normal (I would be too, if I were hauled around like this). But check out that tongue--the night crawler looking thing. That's what it wiggles while it lies in wait at the bottom of ponds and streams. Any fish who ventures too close for a nibble get nibbled itself. Here's a tip to those of you who find yourself in the position of having to move one of these creatures: don't pick them up by their tails--you'll hurt them. Don't grab them by their shells (unless you are experienced at so doing)--they'll hurt you. Instead, use a shovel to scoop them up and deposit them elsewhere. Stay tuned for your next installment of Snapping Turtle Handling Thursday. If there is one thing our planet is woefully short on, it's giant rats. Thankfully, an expedition into pristine wilderness territory in Indonesia has yielded just that: a new species of Rodent Of Unusual Size. This specimen weighs in a a cool three pounds. That makes it five times larger than your average city rat. What makes this tale (tail...) even more charming, is that the rodent was fearless of humans. It even wandered into camp a few times (you have so much to learn about us humans, lil' rat). 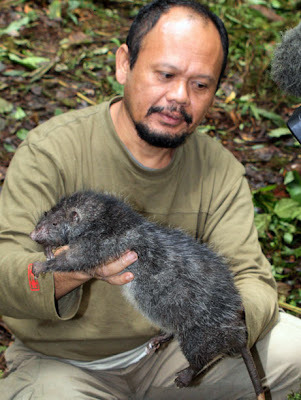 The man in the photo, a mammal expert named Martua Sinaga, has more spine than I. It would take a lot (a promise to pay off my mortgage, for instance) to cause me to pick up a heretofore unknown species of giant rat with my bare hands. Thanks for the story, Hank, Jenny, and Rick. What you're looking at is a mouse afflicted with the 'rhino' mutant gene(s). 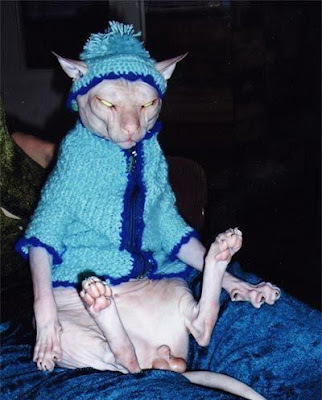 It is a variant on the more comman hairless variety. It's a nasty condition to have. I'm not savvy enough with the scientific terms used in the articles about this mutation, but beyond being hairless, these creatures develop long nails, cysts, glandular problems and a series of skin disorders (obviously). If there are any biologists our there that can distill the scientific reports into layman's terms, I would be much obliged. Thanks for the photo, Teresa. Monica saw my post on the hairworm and dug this up for us. The video speaks for itself (literally), but only watch it if you're okay with watching worms control the brain of a snail from its pulsating home inside the snail's eye stalks. This is Ugly Overload, people. You knew what kind of site this was when you came here. Though chimpanzees are 98.76% identical to humans genetically. The 1.34% difference results in denser bones (they shy away from water because they sink), tougher skin, a strength that is 5-7 times greater than humans (I am 0 and 3 in arm wrestling chimps), and redder, knobbier butts. 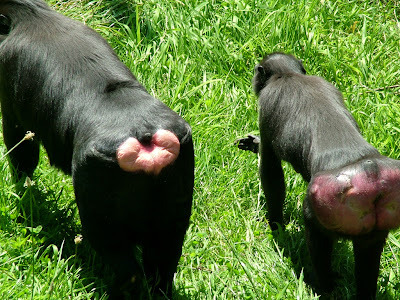 I'm no ape expert, but I'm guessing the chimp on the left is the male, and the one on the right is female. I'm also guessing it's mating season. Nothing sets the mood in Chimpland quite like a red rear end. Mary, a Floridian zookeeper, has forwarded me a cache of wonderful photos of her wards. This is the first installment. Some of you more modest types (such as myself) may want to look away. What you're looking at is a pair of komodo dragons about to be intimate. Isn't that tender? Soon, if their rumpus proves to be fruitful, we'll have another batch of gigantic lizards with lethal drool and hunter's instincts. Thanks for the photos, Mary. I hope the dragons didn't mind your intrusion. I am something of an amateur aquarist, meaning that I've accidentally killed enough fish and rehabilitated enough fish and gone through enough equipment failure and water chemistry debacles to be the guy that people come to for advice. So, when one of our resident ichthyologists, Rasmus, sent me this article from Practical Fishkeeping, I jumped on it. The article is on a pufferfish keeper by the name of Ian Jeffries. His story is much like my own: he got a tank, got hooked, got kids (the chitluns love fishies), and got more hooked. And, like myself, he gravitated towards the uglier of the species available. His fish of choice: freshwater pufferfish (nine different species). 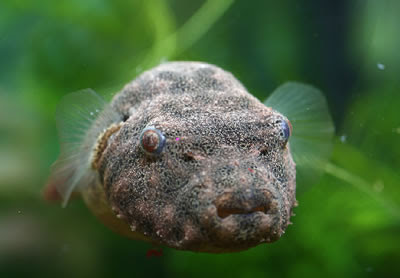 The one below is known as the hairy puffer. Me likey and me wanty. As an interesting aside, Ian has to trim their teeth too keep them from getting too long. I would love to see that kind of grooming in action. Thanks for the link, Rasmus. 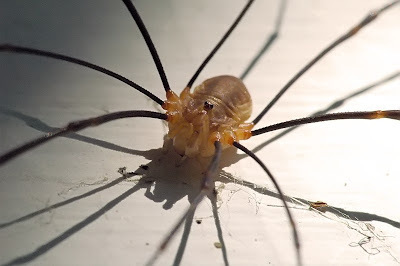 The harvestman is so-called because they are most commonly seen in late summer and early fall. They are more closely related to mites than spiders, as they spin no webs and are non-venomous. They like romantic walks through the woods at twilight, enjoy dining on juicy invertebrates, and, in warmer climes, love to snuggle up in the mulch beneath rocks for a cozy winter. My buddy Alan sent me this link to a Time article. It seems that we've plumbed the depths of the sea a bit deeper and dredged up another 700 new species, including carnivorous sponges (I love it!) and ... much to my horror ... a marine spider. There is so, so much we don't know about our own planet. Can I not have at least one small corner of the planet to myself where I won't be beset by arachnids? Maybe I'll take up residence inside a volcano to be rid of them. But knowing my luck, some nosey biology student would come along and discover a magma spider and I'd have to find a new home. 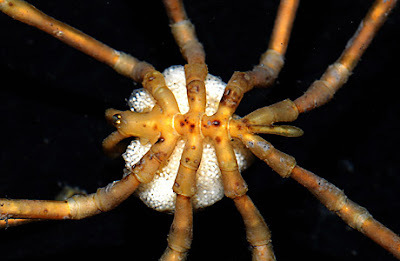 The ONLY redeeming quality of the deep sea spider (see the Antarctic male pycnogonid below) is that it seems to be the one to carry the egg sac around. As a father myself, I can relate. I would still squash it with my shoe...scuba fin...if it came too close, but I can admire it from afar. Thanks for the link, Alan. Our mutual arachnophobia may drive us from the sea (I say as I sigh and wistfully set aside my scuba gear for the last time...). The water buffalo has an interesting history. It is an asian beast, but has been closely tied to human civilization since the beginning. They were introduced early on to the Middle East and Africa, and in Medieval times, European Crusaders brought them back home. Some of those herds are still in existence in Italy and Bulgaria. There weren't any sizeable populations in North American until the 1970s, but now there are herds in several US states. India and China depend on them for milk and meat. The water buffalo is not to be confused with the American bison or the Cape Buffalo. Especially to their faces. They hate that. UPDATE: The original photo I had posted here turned out NOT to be a water buffalo (contrary to the photo's taker), and was, in fact, a Cape Buffalo. So I've swapped the photo. Thanks fo the correction, Stormy Dragon. My best guess is that it is a Malawi Blue Dolphin (Cyrtocara moorii). 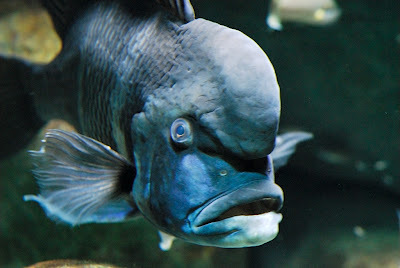 Unless I am wrong (and I am never wrong), then this is the fish that most reflects my own traits. 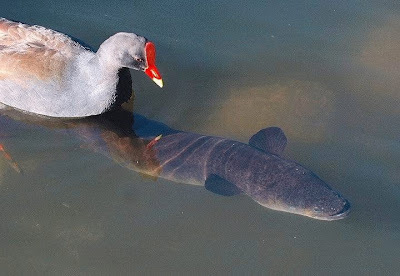 It's got an oversized head, and it feeds by following along behind substrate digging fish and gobbling up the critters that get tossed up into the water column. That's right, let someone else do the hard work. Big head, mild-tempered, and lazy. That's me. I've posted on some stuff that has made me ashamed to be human. This one makes me ashamed to be a biological entity. Once in the water the mature hairworms – which are three to four times longer that their hosts when extended – emerge and swim away to find a mate, leaving their host dead or dying in the water. Now you can enjoy the video, and marvel at how profoundly ugly nature can be. Thanks for the photo, Jade. I'm praying that these worms don't learn to jump species. The woman below had noticed wasps buzzing about her attic space. 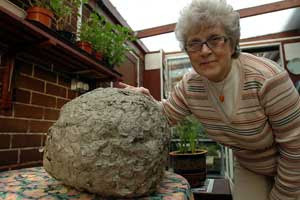 She and her hubby peeked into the attic and found this: A wasp nest that was home to 5,000 wasps, weighing in at over 4 lbs. I can't imagine what my reaction might be at seeing that ball o' fun. I would blink at it. Then blink again. And maybe a third time. Then I'd turn away and head down the ladder. At some point while walking to my front door, I would collapse and enter a catatonic state. I am a shining example of courage to my wife and children. Stories like this make me mad. Very mad. But thankfully, this particular one has a happy ending. 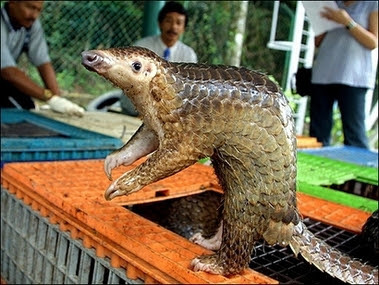 Thai Customs officers were able to rescue more than 100 pangolins and arrested three men attempting to smuggle the endangered animals to China via pickup trucks, where they were destined for the cooking pot. Delicacy? Traditional medicine? I cannot properly express my contempt for this kind of trafficking, which is too bad, because I don't think that pangolins can either. 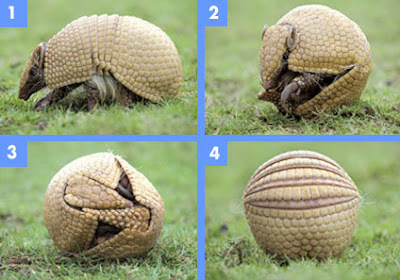 You don't know how much I wish I had this particular talent of the armadillo. Some guy starts bugging me for pocket change, I fold up and roll past him. My boss walks in, catches me blogging, and I collapse in on myself and roll under the desk. My wife wants me to change the boy's diaper, I roll away and barricade myself in the bathroom. So many possibilities. 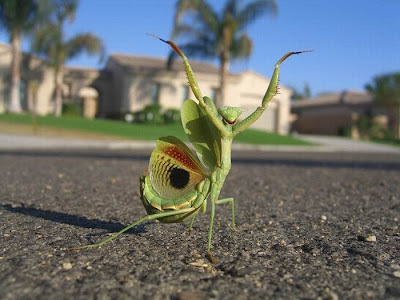 This is nothing but a gratuitous shot of a mantis brandishing itself. You're welcome. The blurry suburban background makes it a bit disconcerting; I don't think we could long survive an attack by a gargantuan mantis. I've seen enough of the world to know that we humans eat a wide, wide variety of foods (some of which shouldn't technically count as food). I'm not surprised that rat is eaten (and--here's a shocker--it's even a delicacy). But why, oh why, must the Thai rice farmers that have turned to serving bandicoot rat at roadside stations (making quite a profit!) boil them hair, tail, whiskers, unmentionables, and all? 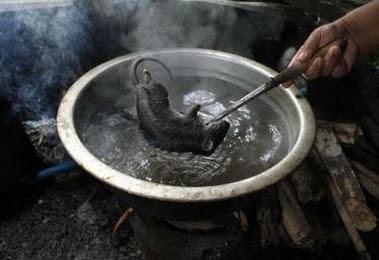 Wouldn't a skinned rat roasting on spit (mmm, with BBQ sauce) be so much more palatable? I'm not an anthrophobe (unlike some of you). Quite the opposite--I tend to like people, especially the ones that will tolerate me (though, those are admittedly few in number). But, in the end, I guess there are a lot of people I just don't understand. 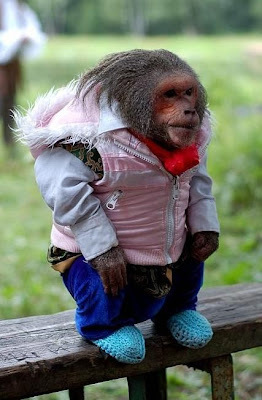 Such as the person who dresses up a monkey like I might dress one of my daughters, or the person who dresses up a demon cat like my grandma. What's worse than a cockroach (no offense, Jade)? An opalescent cockroach, of course. But there's nothing extraordinary going on here, just something ugly (and wonderful, for you bugophiles). 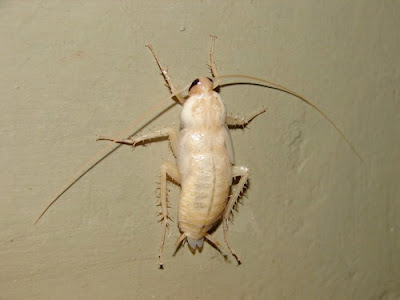 When a cockroach molts it becomes white for about 12 hours before its exoskeleton can harden properly. The last time I molted (sun-sunscreen=burn), I turned a bright red. But after a couple days I settled into a nice, computer-glare pasty white. 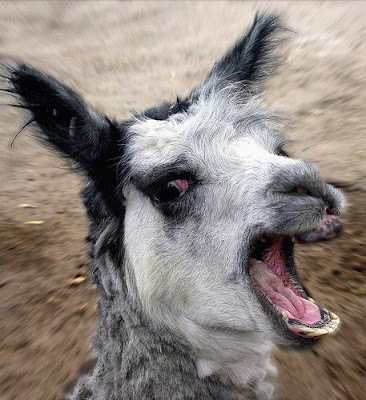 I assume this is a screen shot from a llama horror flick in which the female llama is fleeing the monster/alien/farmer and looks over her shoulder just before being eaten/abducted/sheared.